The DNS is a critical service often exploited by hackers for gathering information about the company attacked or for distributed deny of service (DDOS). It’s possible to be protected from these attacks configuring opportunely the service. The actions to implement are very easy and it will be explained in this article. The laboratory implemented is described in the following picture. As showed above, we imagine that the dns service is reachable from internet for resolving the names of the example.com domain and queried from a inside network for internal resolution. This architecture is enough to synthesize the greater part of possible requirements. Let’s start with the bind installation. For improving the security the bind-chroot will be installed with selinux enabled. Selinux is a layer security that must be always used. A lot of administrators prefer to disable it because they think that it difficult to manage: it’s not true and in internet it’s possible to find a lot of useful forum for resolving problems. With chroot-bind, even if the bind server is exploited (this scenario is always possible, in the 2016 a lot of vulnerabilties have been discovered on it) the attacker has privilige limited (selinux) in a reduced file system (chroot) for exploiting the server. From the moment that the zone example.com will be signed using DNSSEC it’s necessary to create it in a place where named daemon has write permissions and data directory it’s ok.
No change on selinux was necessary: as I told it’s easy to work with it. Note that the named daemon is running with named user privileges as chrooting a process running as root doesn’t enhance security because it’s possible to escape a chroot jail. The configuration file of bind server is /etc/named.conf (this file is mounted with –bind in /var/named/chroot/etc/named.conf). The dnssec is a protocol that adds a layer of security by answers digital signature into DNS data. Each DNS response can be verified for integrity. You can find a lot of information about it in https://users.isc.org/~jreed/dnssec-guide/dnssec-guide.html. With DNSSEC the answers received contain digital signature for message integrity and authentication: the bind server is protected against cache poisoning or forged anwsers. In this way the internal network is protected against attempts to forge the dns answers. Of course the domain queried must be signed. DNSSEC doesn’t protect completely the client because the SO and the browser are not dnssec aware. If a malicious user forges the dns aswers, the browsers doesn’t check the validity signature as resolvers does. If all the world (domain signed, SO, browser and resolvers) was dnssec aware, would be impossible main in the middle attacks in the dns service: unfortunately it’s not so. If it’s possible, I suggest to sign the public zone: in this way you will protect other resolvers against attempts to forge your dns answers improving the security in internet. Below I will explain how to do for signing the public view of the example.com zone. Next step: For completing the signing zone is necessary to call the parent zone for completing the chain of trust (for this step see https://users.isc.org/~jreed/dnssec-guide/dnssec-guide.html#working-with-parent-zone). Let’s start now to create a internal view for serving all the dns request from inside network. This network generally has the recursive functionality enabled and other custom configuration: the public server, for example, can be resolved with its private ip address instead of public. example.com. 3600 IN NS ns1.example.com. Two view have been created. In the public view the recursive is disabled. If you want to be a recursive dns for internet, you can be used for DDOS attack. In this case I suggest to limit the query served configuring the iptables of the server with a rule like that:”ACCEPT udp — anywhere anywhere udp dpt:domain limit: up to x/min burst y mode src” .This rule limit the dns query to x/min with a burst of y (y> x). Allow transfer zone has been disabled in both view. If it is enabled, a malicious user can transfer the zone information from the server. This should contain the ip address of bind slave in case of a bind master-slave configuration. In this case the bind-slave can ask to master to download the zone. With the “auto-dnssec maintain” option enabled, BIND will periodically check to see if new keys are available, or old keys need to be retired, and automatically add or remove the appropriate DNSKEY records from the zone. Allow query is any for both the view because any client can query the dns service. 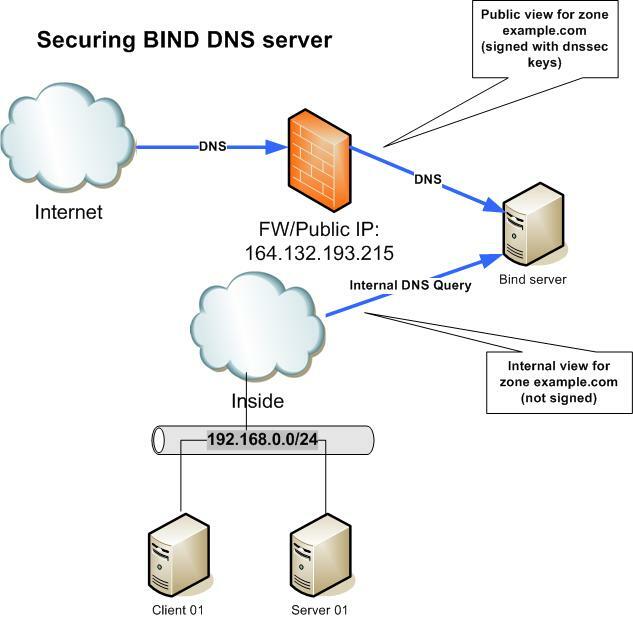 In this article I showed how to secure bind dns server using dnssec, selinux and a view configuration (public and internal). Another suggestion is to always have system operation and bind upgraded to last version available: as I told on bind server this year a lot of vulnerabilties was found and the only way to protect is upgrade the software. Let me know for any question or suggestion.